Melbourne Derby! Victory vs Heart! This weekend see’s the third Melbourne Derby between Melbourne Victory and Melbourne Heart, while it may be less than three years old and only 8 matches have been played between the two, the derby has already been dubbed as the biggest clash in the A-League and for good reason as well. 5 sold out matches at AAMI Park and three matches at Etihad Stadium that have averaged a crowd of over 37,000 people put the matches as the biggest on the A-League calendar. The match is much, much more than just three points and another fixture; it is a 90 minute battle where the bragging rights of the state go up for grabs. In essence it is a David V Goliath match up, with one team trying to beat its rival who has more supporters, more success and has been in the competition longer than the other. 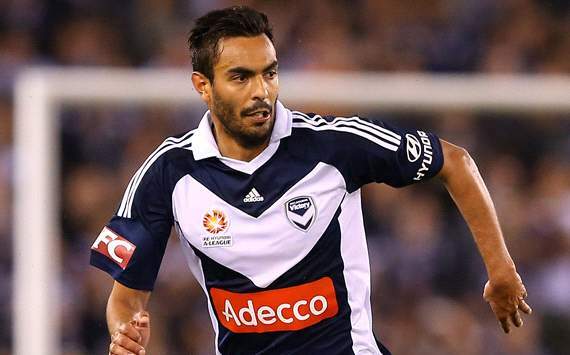 For the Melbourne Victory, they are Goliath. Since entering the competition in the inaugural season in the A-League, they have won 2 Premier Plate’s and 2 Champion’s Plates, to be one of the most successful teams in the league. When you add the Victory have the largest membership base in the league, and also the largest average attendance in the league, it is clear the men in blue are a powerhouse in the league. The Heart on the other hand is David. Since entering the competition in 2010, it has punched above its weight despite being a relative newcomer to the competition. One finals appearance last year and a narrow, heartbreaking attempt the year before have the Heart as a team consistent enough to be a challenger for the finals series, year in, year out. The Heart has also got a fantastic youth setup with the likes of Curtis Good (Newcastle), Brendan Hamill (Seongnam Ilhwa) and Eli Babalj (Red Star Belgrade) all attracting handsome transfer fees for the club. Much like in the biblical contest when David faced Goliath, Melbourne Heart have defeated the Melbourne Victory and head the ledger with 3 wins, 3 draws and 2 losses against the Blue side of Melbourne. The match isn’t just about the 3 points, it’s also about the supporters of each of the clubs and the support groups attributed to each. Melbourne Victory has two supporter groups with HORDA and the Blue and White Brigade. Both are located in the North Terrace area and both have been passionate supporters of the club for multiple years. The Melbourne Heart on the other hand has the Yarraside supporter group which is the main and the only one of the team in Red. The Heart even have the number 12 set aside for the support group with the Victory also dedicating that number to their fans. Unfortunately both sets of fans have been involved in bitter disputes with the HORDA supporter group taking a banner off their Yarraside rivals before a match during the 2011/12 season. Thankfully in the first two games of this season, the action has been decided on the field, rather than by the supporters from each club. So with the final match this weekend, the big question remains; who will win the contest and what should we be looking for as the two team’s battle it out? Well here is my guide into the match starting with the four standout matches so far in the history of the derby. The first ever derby between the two teams showed that despite being a newcomer to the league, the Heart can match it with their cross city rivals. A goal to current coach, John Aloisi, and Alex Terra provided the scene for a memorable night for the Heart, and an introduction of things to come. The match that intensified the rivalry happened on January 22, 2011 when the two teams played out a thrilling draw at Etihad Stadium. After two goals from John Aloisi for the Heart and a goal each to Carlos Hernandez and Danny Allsopp for the Victory, the match was poised for a nailbiting finish. Unfortunately that went out the window when Kevin Muscat provided one of the worst tackles in the history of the A-League on Adrian Zahra and got sent off. Not only would it be his final derby, it would also be the end of his career as he was forced to sit out for the remainder of the season. Many Melbourne Heart fans were angry and appalled by the decision and that bitterness remains to this day as Muscat is now an assistant with the Victory. A three minute salvo of two goals to Matt Thompson provided the Heart with another victory over the men in blue; as the Heart recovered from a goal down to win the match. Carlos Hernandez did score late for the Victory but it was the Melbourne Heart show as they recorded a comfortable victory. The last game between the two teams really didn’t ignite until about 20 minutes to go, but when it did, it would become an instant classic in the battle between the two. After Marcos Rojas scored to put the Victory in front, the Heart responded through their captain in Fred who levelled up the game. Just as it looked likely to end in an entertaining 1-1 draw, Marcos Rojas provided a delightful through ball to Thompson who lobbed the ball over the keeper which just went into the net. The celebration from him and the Victory fans was brilliant, and of roar emotion, and it gave the Victory just their second win against the Heart. Marcos Rojas: Dubbed as the ‘Kiwi Messi’ by many, Rojas has been a revelation to the league this season. 12 goals and multiple assists have helped the Victory to become a powerhouse in the competition under new coach Ange Postecoglou. Currently being scouted by Liverpool and Juventus, Rojas has it all. He has great skill on the ball, a lethal right foot in front of goal and pace to burn. When you combine this with a good sense for goal and a great mind of where to be at the right time, and it’s no wonder big clubs are after the Kiwi. Already capped by New Zealand, Rojas looks set to be big in the land of the long white cloud. Archie Thompson: When you think of Melbourne Victory, you think of Archie Thompson who has been there since day dot and the thorn in many sides who are rivals of the Victory. After haunting Adelaide United in the Grand Final of 2006/07 with 5 goals, Archie was at it again in the last match against the Heart. With the scores deadlocked at 1-1, Archie was on the end of wonderful lead up play by the Victory and scored the decisive goal to hand the Victory the win. The goal will go down in derby history, mainly due to the delay of the goal being given, but also because of the celebration by Thompson, who gave grief to the Heart supporters. Thompson is the leading scorer in Victory history with 66 goals and he will once again be a threat to the Heart in this match. Marcos Flores: Despite struggling with the Victory on his return to the A-League, a fit and on fire Marcos Flores is a danger to any team. After winning the Johnny Warren Medal with Adelaide United in 2010/11, Flores went over to China last season only to return to the league with the Victory this year. Despite playing 17 games and only scoring three goals, Flores will be one to look out for in the game. Fred: One of 5 players who have played for both clubs in their history, Fred will be looking to win for the Red side of the city in this match. In the last match between the two, Fred was the vital component for the Heart as they fought back from a goal down to be level late in the game. If the Heart is to win, then Fred will need to be in the same form. With both him and Garcia in the midfield, it is vital these two provide plenty of runs and opportunities for their team. If not, then the Victory will win the match. Richard Garcia: After joining the Heart from English club Hull City at the end of his contract, Garcia has enjoyed a brilliant season with 5 goals and 2 assists in his 15 appearances. In many of the Heart’s big performances, Garcia has played a massive part and will need to be there again, if they are to succeed against the Victory. The Socceroo international who has played 10 times for the national team knows what to expect in big matches and will be valuable to the Heart team. 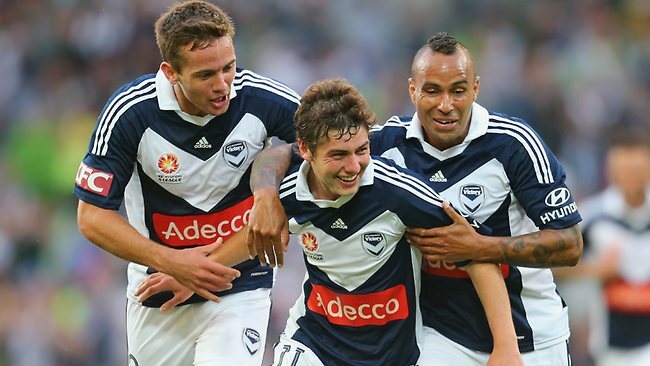 Matt Thompson: Another midfielder who has had a good run when it comes to playing the Melbourne Victory. In the 5th ever match between the two teams, two goals from the midfielder – who can play in defence – gave the Heart a valuable victory against their rivals. Thompson holds the record for the most games played by a player in the A-League and the Heart will rely on his experience to give them the victory. Dugandzic made 37 appearances for the Victory before becoming the first – and only player – to directly transfer from one club to the other. Currently sidelined with a serious injury, Dugandzic has played 29 matches for the Heart and cited their clubs philosophy as the reason for the contentious move. After making 20 appearances for the Victory in their title winning season in 2006/07, Fred went overseas to the United States and the Major League Soccer teams of DC United and Philadelphia Union. 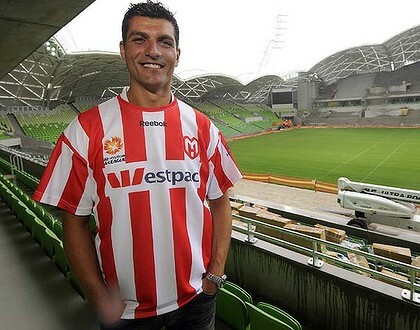 Fred was then signed by the Melbourne Heart and has since become their captain in his 32 matches for the club. Behich made 5 appearances for the Victory before signing for VPL side Hume City. Following that he trialled for the Heart and was signed into their inaugural squad for their opening season. Behich was the first player in the history of the A-League to play for both teams and made over 60 appearances for them in his two and a half years in the club. Behich this week signed for Turkish club Bursaspor and will be unavailable for the Heart this weekend. Between playing for Adelaide from 2005-2007, Sarkies – who is a Melbourne local – played for both the Victory and the Heart in over 40 appearances for both. Sarkies won the A-League title with the Victory in 2006/07 and is now playing for Heidelburg United in the Victorian Premier League. When derbies come around, form goes out the window as both teams lift intensity in the battle with each other. 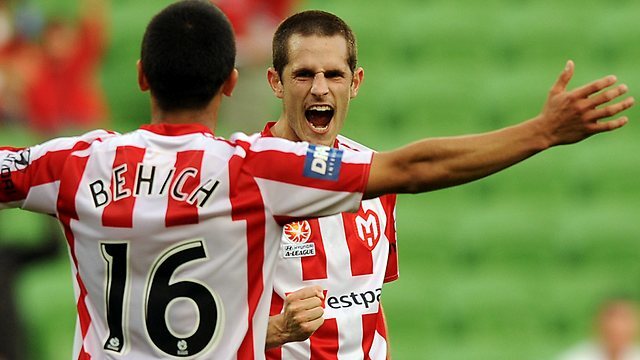 The Melbourne Heart in particular, always rises to the occasion when they play the Victory. Having said all of that though, the Victory is the in-form team of the competition with 2 straight wins and no losses in four matches. On the other hand, the Heart has been inconsistent in form and has lost 2 of their last three matches. Of particular concern was there performance against the Wanderers last week where they were dominated by a team with one less player. If they perform like that this week against the Victory, then they will lose. Overall, the Victory has too many attacking options for the Heart and they should win the match. But don’t ever count out the underdog; the Heart love to cause an upset and if they are allowed too then they will on derby day. Thank you to our contributing special guest columnist Shane Jones.